YAP Tracker :: Deadline 11/10: Premiere Opera International Vocal Competition 2018! Posts > Deadline 11/10: Premiere Opera International Vocal Competition 2018! Deadline 11/10: Premiere Opera International Vocal Competition 2018! Don't miss your chance to be heard by the absolute biggest names in the industry, in what is one of the most esteemed judging and advisory panels ever assembled! 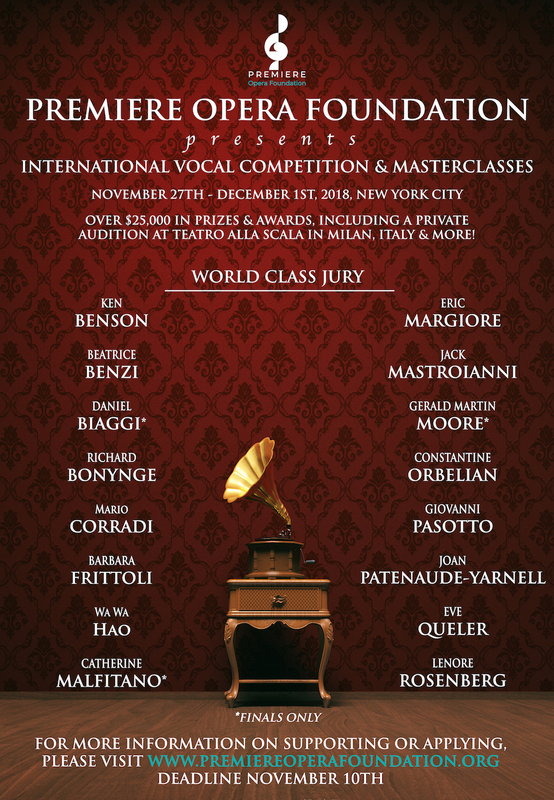 The Premiere Opera Foundation's International Vocal Competition & Masterclasses, in it's second year, is a world class opportunity that will distribute over $25K in prizes and awards, offer unparalleled Masterclasses, a private audition held at Teatro alla Scala in Milan, Italy, an all expense paid Italian opera and Italian language study in Italy, and more! We at the Foundation are dedicated to the promotion and preservation of the operatic art form through discovering, honoring, and nurturing the most promising, up and coming opera singers in the world today, by enhancing their careers through financial, educational, and ongoing advisory and educational support. We would be honored if you would apply. Applying early is strongly recommended - Deadline is November 10th! *Denotes Judge for Finals Only. More jury and advisory board details on our website. More detailed prize information on our website. All applicants will also be considered for paid concerts, recitals & masterclasses worldwide. Feedback from judges upon request and as available, after the competition is completed.